Robin Mukherjee is the screenwriter of award-winning feature film ‘Lore’ (2012). He’s written ‘Combat Kids’ for CBBC and many UK primetime series such as ‘Casualty’ and ‘The Bill’, as well as numerous radio plays and theatre pieces. 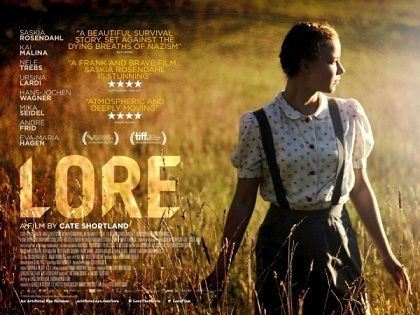 Script Angel caught up with Robin to find out how ‘Lore’ came about and what it’s like as a screenwriter working in both feature films and television drama. So Robin, congratulations on ‘Lore’ which is a brilliant film. It feels like there’s quite a buzz about it. I think so. It has certainly been very well received, which is a great thing. Of course it’s not a ‘blockbuster’, nor was it ever meant to be. But we’re very happy. And the audiences that I’ve seen – at Q&As for instance – have all been incredibly responsive. People get it. Which is all we wanted. What’s been nice is that the release process is such a long one as the film goes out to the various territories and different festivals. TV tends to be a momentary explosion, but this long, slow burn is definitely there to be savoured. How did ‘Lore’ come about? Paul Welsh, the producer, had read an early draft of Rachel Seiffert’s book and, I think, secured the film rights possibly even before it was published. Paul had seen my earlier film ‘Dance of the Wind’ at the London Film Festival and we’d met at some point. I think we understood each other. I liked his sincerity and he seemed to like the way I tell stories. ‘Dance of the Wind’ was very art-house, on the spectrum of watching a plant grow for ninety minutes to Spiderman. Not quite staring at a plant, actually not at all like staring at a plant but, as I said, very art. However, I’ve also got that discipline from Television of being able to communicate widely. He sent me the book and I wrote a proposal for the adaptation. Scottish Screen supported the development, though it took about a year from liking our proposal to actually saying yes. Rohr Films came in early and stuck with it right through. Others came on board but disappeared, which seems to be in the nature of raising production finance. Rohr Films are an interesting company with a slate of quite experimental work where people are allowed to be brave and trust their instincts. So it never felt like a prescriptive environment where I had to tick other people’s boxes. I was given free rein to tell it as I wanted, and then Cate [Shortland, Director] was given the freedom to bring her own vision to the story. Did you hand over your script when Cate came on board or was it a collaborative process? Paul and I met Cate in Berlin to talk about the story, to kick around the adaptation, and to ruminate on the themes and ideas we were trying to deal with. I think we both work in a similar way. We’re both instinctive rather than formulaic. What matters is the truth of what we’re saying and finding the most truthful way to say it. I don’t know much about inciting incidents and all that. Stories are stories. We know how they work. We are stories. You just have to tell it as you live it. So we went very deeply into the material with a lot of research and feeling our way around the territory. Paul was there to make sure we didn’t go insane with it. Although you have to go a little bit insane. There came a point when Cate prepared a director’s draft. Which is exactly what we wanted. She had to make it her own. And what she produced, in the end, was an utterly committed piece of cinema. You believe in the story because there is so much self-belief within it. Was it a straightforward development process once Cate was on board? Pretty much. Until we decided we had to do it in German. Then BANG. We lost at least a year. One of our major English funders backed out because they were only able to support English language films. Presumably there was a point at which you handed the script over to Cate? Was that scary? Not at all. The worst thing for a writer is if a director just shoots your script. You want them to bring something to it. You want everyone to bring something to it – the Director, the designer, the DOP, composer, the Actors. In a way Cate was working with different sources of material. There was my script, the original book, all of our research, all of our thinking and, of course, her own perspective both personal and as a film-maker. In television the director pretty much shoots the script that you’ve written. Were you worried that the film that emerged wouldn’t be the film you’d written? Well, as I’ve said, you don’t just accept the collaborative process, you welcome it. It is slightly different to television in which everyone is quite compartmentalised. A film emerges from the energies of everyone involved. Which is wonderful. In the end it is the Director’s film. Depending on the director. Cate was offered this project for a reason, because of the way she makes films. She makes it her own. But then we’re all a part of it. There’s a lot of fuss, often, in television about who did what. But it doesn’t matter. I’ve known producers who tell you ‘I thought of that’. But the reality is they didn’t, and if they did it was probably wrong! As a writer, the best ideas, the best lines and all of that, you don’t know where they came from. They appear on the page and it might be that they’re responding to the way an actor moves his face. But there it is. Ego is no help in this process. It sounds like you had a great experience on that film. You also write radio and theatre and tv. Do you write in all those mediums because different stories demand different platforms or because you feel you need to diversify to sustain a career? I’m just a tart. Seriously, I think all of those mediums offer something different, something exciting from a creative point of view. I love radio because the word is so important, and you plug straight into people’s imaginations to create a mood that is very intense. I love tv because it’s so widely accessible. You do something and you know that millions of people have been engaged with that. Also tv gets made quickly. Film allows you to tell a big story with very deep themes, very layered. You can also be more questioning and enigmatic perhaps, than in television. Your audience accepts more experimentation, more risk. With tv, you trade enigma for accessibility. Which is fair enough. How do you decide what to work on next? Is it a mixture of commissions and spec work? Yes, that’s about right. It’s a mix of things we’re asked for and projects we initiate, although the ones we initiate inevitably get swamped by the things we’re asked for. The trick is to be asked for something you wish you’d initiated. But there’s always stuff bubbling away. You have to find the right person and the right opportunity, the right moment in time to convince someone else of its worth. Emerging writers often feel that if they could just break in and get that first credit that after that it’ll be a full-time paid job where the work just keeps coming in. Is it really like that, can you ever just sit back and watch the work come in and pick and choose or do you still need to hustle? Many writers, when they first break in, have a flavour-of-the-month period, which may last a few of years, where every series is asking for an episode, and you’re run off your feet. I think one has to be careful that it doesn’t become the entirety of one’s creative exploration. Television is great fun but you can learn to compromise too easily. You may have to curtail your creative ideas but at least you get things made. In a way, that’s the trade-off. But yes, the reality is that every project still needs hustle. Even if a project comes your way and you’ve got a producer doing most of the hustling you still have to be part of that process. And it’s a necessary process. To have a sustained livelihood in the industry you need to be constantly fertile and proactive. There’s no sitting back on your laurels. How many projects are you actively working on at any one time? There’s always the main focus. For me at the moment that’s a new feature film – we’ve got some production money and a director who is very much a part of the project. Then there’s another adaptation. I like the book and we’re currently raising development money. There’s another project in which a company has come to me with a new director they want to develop, which sounds very exciting. Oh, and I’m also writing a book on screenwriting which I’m due to deliver in October. And then, of course, there’s the notebook, my scribbles, which is always festering with ideas. Before you were a full-time writer, were you writing stories and did you know you wanted to be a screenwriter? Oddly enough, I was put into the remedial reading set in primary school because my reading was under-developed. What happened was that the teacher would walk around while we read from the books we were holding. One day she sat next to me and realised I was just making them up. I thought that’s what everyone was doing. Then she explained about all those squiggly things: written words. I soon caught up but telling stories definitely preceded reading them. I write for different reasons but mainly it’s to make sense of the world. Or to try to. I’m told if I don’t write for any period I become a bit grouchy. So furthering one’s career was never the impulse. Neither are prizes or money. Writing is just wired into me. In fact I didn’t have an ambition to become a professional writer. One day my girlfriend sent a script I’d written to the BBC and they wrote back. I couldn’t think why the BBC had written to me. But they liked something in what I’d written and gave me a mentor, Tony Dinner, who I’m in touch with to this day. What’s the one piece of advice you’d give to someone starting out? In the early days I did all sorts of jobs, mainly because I couldn’t really commit to any other kind of career. And of course I was writing. I remember coming home from a gardening job one day, sitting on a bus, cold, wet, muddy and, frankly, pretty miserable. I asked myself the question: if my writing only ever gets me to this place here, tired, grubby and broke, would I still do it? And the answer was yes. I would. I guess my advice is to ask yourself, do you have that commitment, that conviction?